Pretty Sis and I went out for dinner with Mom again at Guu Aberdeen. I’ve also recently downloaded a new app onto my phone which will explain the effects on the pictures. I hope it’s not too distracting or ruining for your viewing pleasure but I really like it! Anyways, back to the food. Among the usual choices, we also ordered some new stuff. 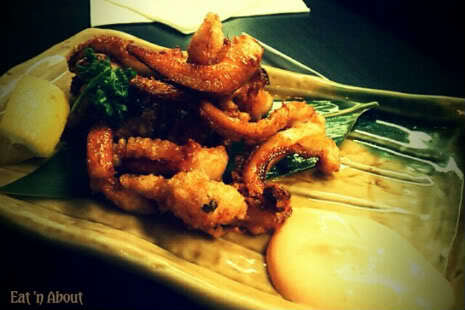 First up, while waiting for Mom, we started with the Deep-fried Squid Legs w/ Spicy Mayo. It was really good, but a bit small. The mayo adds a kick but nothing too intense. They were pretty big pieces though. 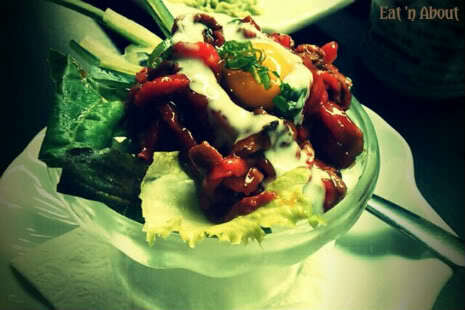 Next was the Beef Yuuke. For some reason we both thought that it’s the Beef Carpaccio but it was totally different. For one, it looked absolutely horrifying. I described it as either like that ground beef you see at butcher shops, or like it’s an actual organ, because it was really red and bloody looking. However, it tasted terrific. We ended up really liking this choice. The quail egg really added a smooth, slithery-ness to it. 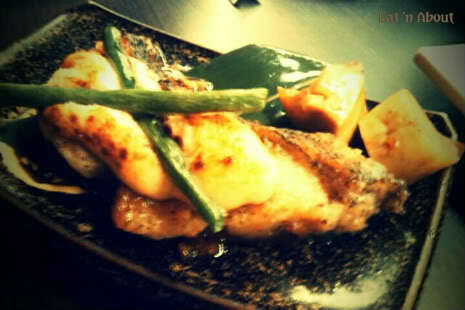 Then came the Misomayo, which is grilled Black Cod with mayo on top. We all found this overly salty though, and I only had a bite and that was enough for me. Mom really enjoyed the braised then broiled bamboo pieces served with it though. She said it was very flavorful. 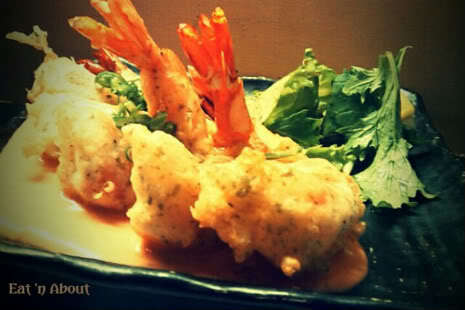 Lastly was what’s called the Puri Puri, which is 5 jumbo prawns deep-fried and finished with a sort of piri piri sauce. The prawns really are very big and very “bouncy”, if you know what I mean. The sauce was kinda like thousand island (as with most of their sauces) but with some spiciness. So overall another good dinner at Guu. It was very loud haha.